MNP Poll: Where on TV will you watch the Senate hearing on pork scam? The Senate Blue Ribbon committee will resume today to hear the testimony of Ruby Tuason, one of the accused and now a potential state witness in the P10-billion pork barrel scam. As usual, news channels and their online websites will carry the much-awaited hearing which will begin at 9am. 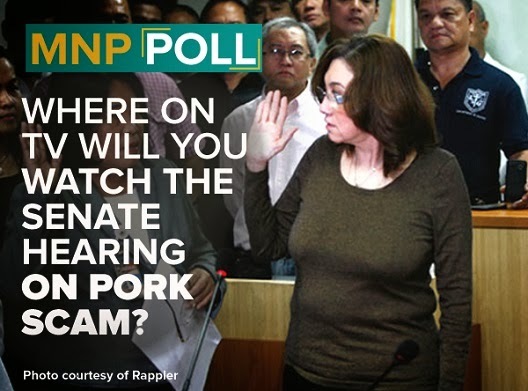 For our MNP Poll, we are asking you this question: Where on TV will you watch the Senate hearing on pork scam? Let us know by voting in our poll below. Where on TV will you watch the Senate hearing on pork scam?